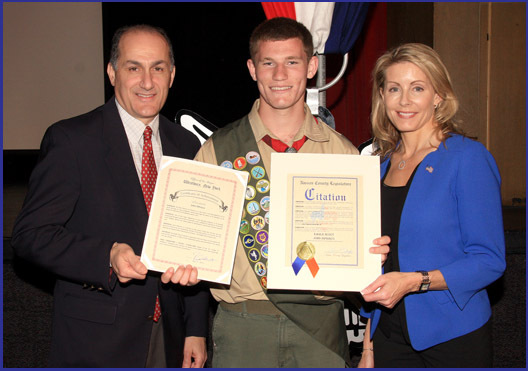 Nassau County Legislator Laura Schaefer recently attended Boy Scout Troop 305 Eagle Court of Honor for John James DiFrisco which took place at Carle Place High School. “John has given back to his community and serves as a wonderful role model for future scouts. It is an honor to join with him on this momentous occasion.” Said Legislator Schaefer. Shown in photo, left to right: Village of Westbury Mayor Peter Cavallaro, Eagle Scout John James DiFrisco, and Legislator Schaefer.